In Lesson Eight we now move on to the Four Sevens and Eights of The Minor Arcana. The Seven and Eight of Wands, Cups, Swords and Pentacles. We are over half way through the journey of The Four Suits and their individual energy is beginning to build. When we last visited the Four Suits in the Sixes, they were all experiencing a bit of respite from the struggles, dramas and upsets of the Fives. They were being given time to rest up and re-charge their batteries. No great demands were being made of them as they had overcome the challenges of the Fives. However, life is ever-changing in The Tarot and nothing remains constant or permanent. As we approach the Energy of The Sevens, the Universe once again will demand something of all Four Suits. At this stage of their Journey, each Suit is beginning to develop a deeper understanding of their Elemental influence. Each Suit should by now understand the nature of life and the constant turning of the Universal Wheel. They must expect that the stability of the Six cannot go on forever. They are bound to feel a shift in their Elemental Energy as Seven draws nearer. They better be prepared, for Seven is on its way, and with it comes deeper challenges for the Suits to overcome. The Four Sevens in The Minor Arcana correspond with Card Seven in The Major Arcana, The Chariot VII. He who can rise to the challenges brought about by the Seven, will victorious. But make no mistake in thinking that their challenges will be easy to overcome for The Chariot and Seven bring the need for tenacity, resourcefulness and self-discipline. Introspection and reflection must also be faced. They must really begin to learn the reasons behind why such challenges come their way, and to learn from any past mistakes. They are the creators of their own reality. If they now face challenges, the finger of blame can only be pointed internally. Will they have the courage to di that or will it be left to a later stage? The Wands will face further physical challenges, The Cups will be challenged emotionally, The Swords face psychological challenges while The Pentacles will be challenged on the material plane. Let us see how much each Suit has learned from their past experiences, as they stare into the powerful face of Seven. Before we launch in to the Four Sevens of The Minor Arcana, please lay them out in front of you and attempt your own interpretation. Record your findings in your Tarot Journal. So let us now visit each of The Four Suits as they Enter the Scenes in Card Seven. Just click on the following Links, The Seven (VII) of Wands The Seven (VII) of Cups The Seven (VII) of Swords The Seven (VII) of Pentacles or the Images below to go directly to The Individual Card Pages.However before that, take some time out to read the The Sevens Intro first. When you are ready to proceed, click on the Images below to go directly to their Individual Pages. Please read The Sevens Intro first. Finished reading through all The Sevens and eager to see how well they have overcome their individual challenges? Will any of them get left behind, stuck in the Seven, while the others forge on with their journey? As Eight rapidly approaches, it will not be before its time, or a minute too soon, for Eight is just what they all need now. The Four Eights in The Minor Arcana are linked with Card Eight of The Major Arcana, Strength VIII. With Eight comes the success of inner-strength . Not muscular strength, but the strength of commitment and resolve, the strength that is needed to free one from internal and external restrictions. It is Eight that brings strength of convictions and the determination to see things through to the end. Eight gives The Suits the strength to do what has to be done. Eight will propel them forwards into following their true soul-purpose. It is with Eight, The Suits will get their first real taste of what being successful is all about. Eight will empower them to fight for what they want and for what is rightfully theirs. With Eight forcing the wind into their sails, they now have the chance to achieve their dreams. The end of their current journeys are in sight, the glittering prizes dazzling in the distance, the rewards for all their hard work and effort now a real possibility. They must utilise the energy of Eight to its very maximum, for much can be achieved under its influence. Eight brings power, success, release, and opens the door to their individual inner-strength so that it can be used to overcome any final hurdles in their path, or to rid themselves of unnecessary baggage, restricting circumstances and narrowed beliefs. However, yet again, the choice is theirs to make and it will be up to the individual Suits as to how well they utilise the Energy of Eight when it descends upon them. The Universe will not interfere with Free Will, so we the readers must now sit back and watch and wait, for we can only bear witness to their journey. The Four Suits must individually figure it our for themselves. As Eight arrives upon The Four Suits, Wands will be eager to take advantage of its powerful releasing energy. We left them struggling to remain on top in The Seven, to not fall to the opposition or competition. They are bound to jump aboard its explosive energy so that an end can be put to set-backs, delays and those who wish to block their progress. The Cups sit and wait for the Energy of Eight to filter through. They will be both nervous and excited of its potential. The Eight will ask a lot of them, but will stand by them when difficult decisions have to be made. 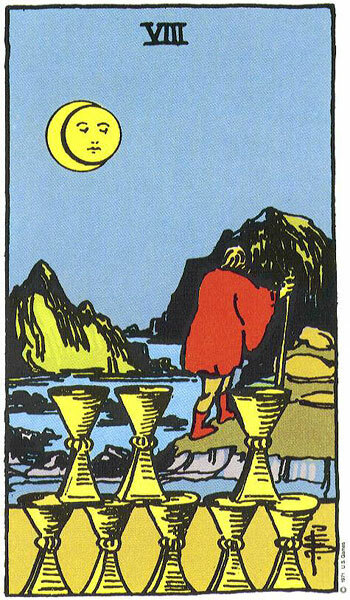 Regardless of how emotional the Cups will become, the Eight will unleash the inner emotional strength which is badly needed if they ever want to find true happiness. Without this Eight, The Cups could easily get stuck in the Seven or even slide back into the Six. If they want to extract the full potential of Eight, they must be prepared to accept change and to let go. The Eight will help them if they allow it. The Swords may not even be aware of Eight’s arrival as they are still trying to come to terms with the Seven and all preceding numbers. For The Swords, they may be in the last chance saloon at this stage, and of all The Suits, are the ones who badly need the energy of The Eight of catapult them out of their apparent restrictions and limitations. Never before has their inner-strength meant so much to them. They will need to wield it like the mighty Swords they surround themselves with, for their Swords have ways and means of dealing with inner-strength when it attempts to make an appearance. It will take great courage and conviction on the part of The Swords to grasp the opportunity of The Eight in order to release the potential of their inner-strength once and for all. They must achieve this before their own Swords hack it to pieces. Can they do it? The Pentacles will not be too overwhelmed by the arrival of Eight for they have been experiencing its energy for some time now. It is an energy they are familiar and comfortable with. 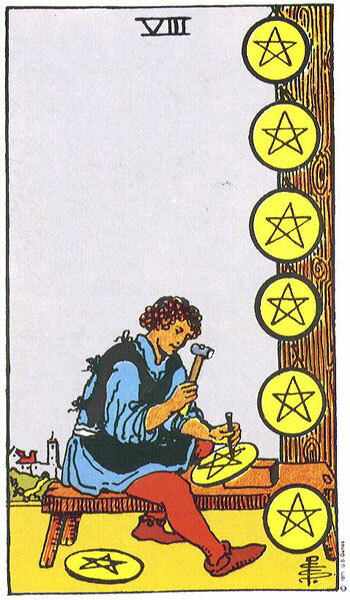 Eight arriving at the front door of The Pentacles will not have to knock, for it has its own key and has been in and out of their lives many times. Eight knows the deep inner-strength of The Pentacles for it has seen it tried and tested many times. The Pentacles already know the potential of Eight, and the wonderful success it can bring when harnessed properly. For The Pentacles, they are prepared, ready and waiting for Eight. They know exactly what to do when it arrives for they have thought about nothing else. Like The Wands, The Pentacles will seek to take full advantage of Eight’s energy to make what is already a success even more successful. For The Pentacles Eight will be the icing on the cake, and for the business minded Pentacles, Eight will help their profits soar and take them to new heights. The Pentacles have nothing to fear from Eight. This is what they have been working towards and what they have expected. Before we race to read the stories of The Four Eights of The Minor Arcana, it is time once again to lay them out in front of you and attempt your own interpretation. Record your findings in your Tarot Journal. So let us now visit each of The Four Suits as they Enter the Scenes in Card Seven. Just click on the following Links, The Eight (VII) of Wands, The Eight (VII) of Cups The Eight (VII) of Swords The Eight (VII) of Pentacles or the Images below to go directly to The Individual Card Pages.However before that, take some time out to read the The Eights Intro first. When you are ready to proceed, click on the Images below to go directly to their Individual Pages. Please read The Eights Intro first. I often have to halt the flow of information from a Querant who is over-eager to explain their situation or issue when they come for a Reading. I explain to them that I only need a certain amount of information, because if I know too much, it will be hard for me to remain objective in the situation. Why should this be so? As Tarot Readers or Consultants you will become natural empaths, that is unless you remain terribly controlled and clinically detached at all times. Empathy makes for a better Reader, but all Readers must strive to find the correct balance between Detachment and Empathy. If not, there is a risk of unconsciously becoming emotionally involved. This results in us, the Readers, subconsciously desiring a certain Outcome which is in line with what the Querant wants. After all, The Querant sitting before us appears nice, friendly and very genuine. They may also be upset and have managed to relay some powerfully disturbing information before we had a chance to stop them. The tears in their eyes, or desperation in their voice, can instantly put us standing in their corner of the Ring and taking their side. When this happens we can unconsciously manipulate the meanings of the Cards in their favour. We unwittingly give the Querant what they think they want, rather than what is in their highest interest. Unless we enjoy seeing people suffer, none of us want to be the bearer of disappointing or bad news. A woman comes for a Reading, asking if the husband who has just left her for another woman is going to come back to her? Although angry, she still loves him and there are children. She talks about not being able to go on and how upset the children are. The Cards to the detached observer tell a sad story with no ‘happy ever after ending’ but how can we deliver such news to this sad and distressed woman. Suddenly, we want her husband to come home and say he is sorry. Of course she has done nothing wrong and we are sure she was not lying when she said their marriage was perfect before he left. We have never met this woman before, but suddenly we think we know her as if she is a friend. 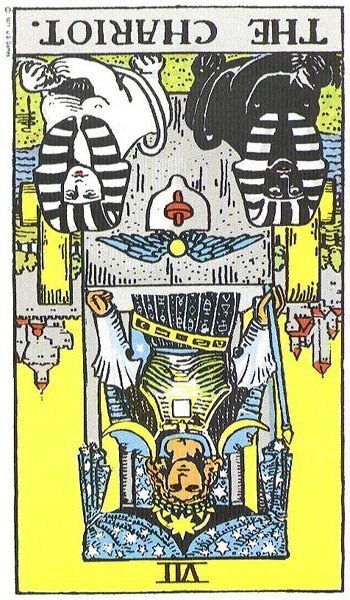 So we pull a few more Cards to go alongside the bad news ones, and before we know it, we have changed the story around and hey presto, there now is a very good chance of his return and life returning to normal. The woman leaves relieved and smiling. We are left sitting with a disturbing and uneasy feeling. What have we just done? All Readers come up against this challenging area when doing their own Readings. Regardless of how detached we may think we are, we still harbour certain expectations of our individual situations. I have myself on many occasions, re-shuffled my cards and drawn again on the basis that I was not happy with what came out in the first draw. We can make several excuses; we forgot to cleanse the Cards, we didn’t shuffle enough, or our mind was not totally focussed on the question. These Readings, whether done for ourselves or for others are Tainted, and can not be fully relied upon for their accuracy or advice. This does not only happen in Tarot Reading. It happens in any form of divination or discipline that requires us to access information that is otherwise hidden from us. When that hidden information has to be interpreted it leaves the gate wide open as to how we go about this. When there are several interpretations available for every bit of information revealed or uncovered well, it is easy to see how we can ‘fix it’ to suit ourselves or others. One single story can be manipulated to create several different versions of events. We see this in courtroom dramas when legal teams bend and twist stories and events that show their clients in a favourable light while casting a dark one on their opponent. Back in the times of the notorious Tudor Courts, a simple, minor incident, or a careless word could be turned into something dark and treasonous in the ruthless search for power and status. They were the dangerous masters and mistresses of manipulation and tainted interpretations. How do we as Readers guard against Tainting our Readings when Reading for others? We ask the Querant for only the briefest background information. We tell them that if they tell us too much it may tamper with the Reading. No one paying you money will want that. If the Querant is determined to keep talking, you The Reader must take charge and stop them. I sometimes have to put my hand up and say as politely as I can to ‘stop’. Some times I say, ‘no, don’t tell me any more please, for I have all the information I need now. Let us see what the Cards have to say shall we? I can then find it quite frustrating when the information they have told me comes up instantly and obviously in the Cards. Me then repeating it back to them sounds just like that, me repeating back to them what they have already told me and not gained from my knowledge of the Cards. If they manage to get all their story out before you have had time to draw breath, then there is nothing you can do but go for it and approach the Reading in a very disciplined manner. Your natural inclination will be to sympathise with the Querant, so visualise a white light surrounding you and set the intention firmly in your mind that you are going to do the Reading with your client’s highest interests in mind. As you Read, keep checking back with your self to make sure you are not drifting involuntarily into the Querant’s corner. Stay with the Reading and repeat over in your mind that you are genuinely searching for the truth and do not want to be overly influenced by your Querant’s emotions or version of events. How do we avoid Tainting our own Readings? This is a method I learned while studying Dowsing as the same tendencies occur when using this ancient discipline. Set your intention or Question for the Reading. It is a good idea to write it down and put it in front of you. Make sure you and your Cards are cleansed energy wise. Call upon your higher-self to assist you in your Reading. This is not a long drawn out ritual, but done is a few seconds. Now as you shuffle the Cards, either out loud, or quietly to yourself repeat your question, word for word, as strongly and as firmly as you can. Keep this going with absolutely no pauses or breaks until you have stopped shuffling. This should block out any unwanted interference and tainting. If you let your mind drift while shuffling for yourself, you will automatically find that you start wishing and hoping for certain Cards to come out. The same applies for worrying about a certain Outcome when Reading for yourself. If you are going to see your consultant with regards to results of blood tests or biopsies, you may be feeling stressed and fearful about getting bad news. 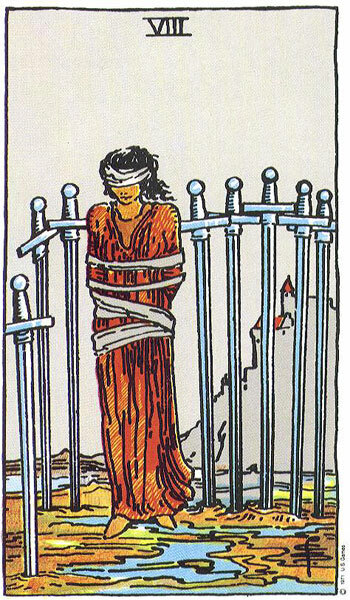 If you fixate on this when attempting to Read your Cards, you might find that your Cards mirror your fears. This can terrify the life out of you. Use the same method above to counteract these tendencies and to block unwanted interference. Here we are in this grey area again. How do we Read for family members and friends when we know so much about them before hand. We also have opinions about them, how they live or should be living, whether their partner or spouse suits them or not, whether they are wasting their life or are out of control. 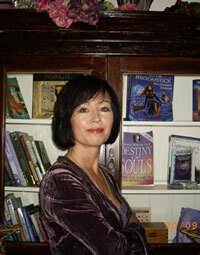 Family and friends are often the first people you will Read for when learning Tarot. They are eager and you want people who are not going to put you under pressure, so it suits all round. However, your family and friends see you as just learning and probably won’t be able to Read that well. They agree to a Reading to support you and to have a bit of fun. It can be very awkward when something turns up in their Cards that is very personal, something you didn’t know about them, something they didn’t want anyone else to know either. You might see problems in their relationships or marriages, problems you would never have guessed. You could see alcohol problems or financial issues. You may see them in a whole new light. You, yourself, may even make an appearance in their Reading. To be honest, you really have to find a way around all this because these will more than likely be your first clients, paying or otherwise. 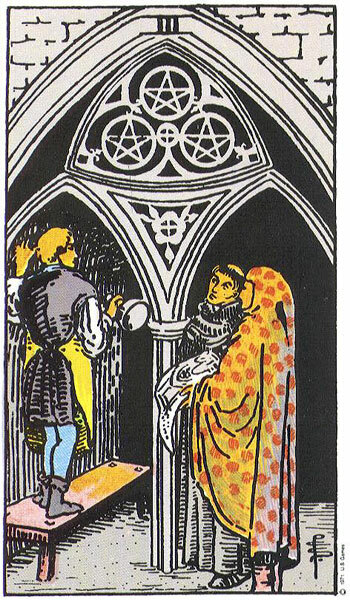 However, if a Reading is requested of you, where you are personally involved, or too closely connected, it is advisable to politely decline and explain why. You cannot offer an unbiased and objective Reading under the circumstances, and your friend or family member would be best advised to find another Reader for the purpose. When you get involved in Reading for friends and family you will automatically be privy to personal and private information that they may not normally have shared with you. Families are famous for internal gossip and the same applies to close groups of friends. Rest assured you are being talked about at times, just like you will talk about others when they are not around. This is all perfectly normal as long as the comments made about those who are absent are positive. When you are Reading for Family and Friends you must Read on a ‘strictly private and confidential basis’ even if you are just starting. You cannot blab to your family at the dinner table about what you saw in your cousin’s Tarot Reading. The same applies for all Readings but it is with Family and Friend Readings we can get sloppy and not take it too seriously. In fact, unless, your friend or family member has given you permission to say you have done a Reading for them, then you should not disclose this information to anyone as they may have good reasons for keeping it quiet. 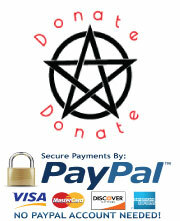 If you are thinking about eventually becoming a Professional Tarot Reader, this will get you off to a good start. Once people know that you are not going to start talking about their Reading in front of others when you meet them out socially, you will begin to earn their trust and respect as a Reader. Your reputation for a professional approach will grow and spread. Here we come to another situation when coming up against Tainted Readings. What do we do with the client who comes to us on a regular basis? This is simpler than you think. Once you have established yourself as a Tarot Reader, you will have certain clients who like to check in with you every now and then when they need insight into a new situation in their life, or are having trouble with a recurring one. They found your initial Readings extremely beneficial, and worked hard to implement any constructive advise their Cards revealed. They felt more focussed and determined after their Reading, and got on with their life. Each time something new happens in their life, either positive or negative, they like to come to you for a Reading for they believe it keeps them on the straight and narrow, and gives them better control in their life. They like an unbiased third-party opinion of what is going on in their life. They also trust you because you have been truthful and honest with them in the past, even when the Outcome of their Readings was not always what they had hoped for. They return to you because you will tell it as you see it, and because most of what you have said in the past has come about. They also find they have a good rapport with you. You know their story at this stage, their ups and downs, their strengths and weaknesses. They do not have to pretend with you. They come to you expecting you to be open and engaging with them. They know they can talk to you. You the Reader have gained their trust and respect. They value your opinion. This leaves you in a very different situation. You can be much more direct and upfront in your Readings with the Regular Client. In fact they will expect it of you. A Regular Client will enjoy a two-way flow of communication, and will want to be involved in their Reading. The Regular Client also becomes somewhat of a Tarot Student as they become familiar with the imagery and meanings of the Cards. 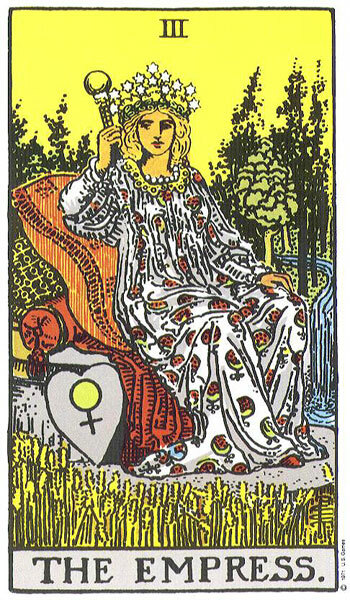 They also have their certain, ‘same old, same old cards’ that continue to turn up in their Readings. These are generally their Karma Cards; challenges or issues that are constantly reappearing, or certain aspects of their personality that exert strong influence over their individual situations. Many times they believe they have dealt with, or worked through certain Cards in their Readings, only for them to feature again in future Readings months down the line. When Reading for Regular Clients it is very interesting to help them Chart their Progress through Life, and over all the obstacles and challenges they face. Through Regular Readings we can pinpoint any slipping back into old habits or patterns of behaviour that the client may not be consciously aware of. We can spot their little demons reappearing and draw their attention to them so that they may step in and sort them out before they get out of hand. We can help them intervene in their own life before any real trouble occurs. Regular Clients often view their Regular Tarot Readings in the same way they view their dental check-ups. They do their best to look after their teeth and keep them healthy, but like to have their dentist take a good look on a regular basis so that any problems can be sorted before they become troublesome. Prevention is better than the cure. With Tarot Readings, the Regular Client likes to ‘check in’ just to see how their lives are doing too. Because these Readings are approached on an open and fully honest basis, the chance of them being tainted is dramatically reduced. I have several Regular Clients who use Tarot Readings for the purpose of Charting Their Progress and for me, here is where Tarot is significantly beneficial. Tarot, if you allow it, will guide and direct you throughout your life. In this manner, it can be used as a self-counselling and self-development tool. It will highlight your karmic issues so that you can deal with them rather than taking them forward into another life. Using Tarot on a regular basis can empower you to live the life you want, rather than put up with the one you have, by lighting up the pathway in front of you. Tarot will take you by the hand and guide you through the ups and downs of life if you are prepared to listen to it and heed its advise. Clients who come for Regular Readings generally agree that their life has been enriched by the deep knowledge and wisdom contained within their imagery. They know that Tarot acts as the bridge to their higher-self, the self they aspire to be. Tarot connects them with who they are meant to be. An excellent way to get to know The Tarot Cards is by doing a Daily Reading for yourself. Now, I don’t mean sitting down and doing an elaborate layout or Spread, with much thought given to the wording of questions etc. What I mean is a simple one, two or three Card Reading for yourself before your day kicks off. I have got into the practice of doing this every day and it is amazing how accurate they turn out to be. Doing a Daily Card Reading for yourself can be of immense help when you are not particularly feeling up to the day that lies ahead of you, or when you are lacking motivation or self-belief. They are also helpful when we know of difficulties we are going to encounter, for they can give us that boost of morale we so badly need to get through them. They can also give us pre-warnings of problems that we are likely to encounter, and even offer some advise on how to handle them. And so with our Daily Card Readings, we can step out into the world, or just even down the stairs, feeling more in control of our life and the day ahead. With our Daily Card Reading we won’t suddenly be taken by surprise by events of the day, for we will have sensed them coming. However, it does happen that our Daily Card Reading only means something to us, or is fully understood by the close of the day, when events have already happened, come and gone. Then we glance at the Cards we drew that morning and say ‘ah, now I get you’. Therefore it is important not to discard your Daily Card Readings just because we do not get what they are trying to tell us. This is how we learn. By reflecting on them later in the day, we can see so much more that we didn’t see that morning. Hindsight gives us 20/20 vision, but again this is how we learn. As time goes by you will begin to make more and more connections with the Cards you draw for your Daily Readings, and will learn to trust them. However, no Reading should ever interfere with your free will. Remember, you own the results of your Reading and not the other way around. You can do with them as you wish, act on them or ignore them, but never blindly follow them. The more you practice these Readings, the stronger the energy builds. You will see the strength of this energy when you pull a couple of Cards in the morning and they are just spot on with what you are planning to do with your day. Let me tell you the way I do this, and I stress, it is very casual. I am very busy writing this course and a lot of others things besides. I do not have the time for elaborate Spreads and much thinking first thing in the morning. I use a Deck that I have dedicated to myself. I only use these Cards for my own Readings. Therefore, a certain energy has built up around these Cards. The energy is my energy, and so I feel each time I use these Cards, they are becoming more finely tuned into telling my story for they have got to know me well. At the beginning of each week, I give the Cards a thorough Cleansing and Clearing by dealing them out into three separate decks while invoking The Violet Flame around them. Surrounding them with White Light will have the same cleansing effect. What this does is separate all the Cards of the previous week’s Readings and leaves them ready for the new week ahead. I do not cleanse the Deck again until the following week but will certainly give them a very good shuffle each day. My Deck is now ready for shuffling. I give the Cards a good shuffle while simply asking my Higher Self ‘what do I need to know today?’ or ‘what should I be aware of today?’ or ‘what will help me with my day?’ or ‘how can I get the best out of my day?’. When I have finished shuffling, I pick the Card from the top of the Deck and the Card from the base of The Deck. I rarely draw any more for I am determined that these will be enough. However, if the Cards I have drawn are unsettling, then I sometimes pull a couple more for clarification. I turn my Cards over to see what I have drawn. I may spend only two seconds looking at them, or possibly a couple of minutes if I am unsure as to their message. Then I leave them down beside my computer where I will be working all day, and there they stay until the next day. If I have not received their message loud and clear, I will glance at them occasionally throughout the day to see if any information filters through from them. Usually it does, but if not I will have a look at them just before I turn out the lights before bed. Sometimes it is only then that they become significant to me. This can happen for many reasons. On some occasions the day is almost over before a situation or incident occurs, or a phone call comes in bringing with it the news or information the Cards had indicated that morning. Sometimes I just don’t get it, simple as that. When that happens, it is a humbling reminder that I am still a student, and also that maybe that day wasn’t particularly good for divination. Any witch worth her salt will agree that there are some days that are better than other when it comes to making magic or craft-working. As a Tarot Reader, you will experience this temporary glitch yourself. I often hear from past students who have gone on to become Professional Readers of the terrible day they have had at a particular Holistic Fair or Card Reading Night when they have found it almost impossible to do a proper Reading for anyone. Regardless of what level of Tarot Reader you are, it happens to us all from time to time. Let me give you some examples of Daily Cards I have drawn in the last week. Today, I drew The World and The Hierophant. No rocket science needed here I thought to myself. The Spiritual Teacher of The Heirophant passing on his knowledge to the two disciples kneeling before him. And how far was The Hierophant spreading his word? All around The World, that far! Well, here I am today, sitting at my desk writing and typing my Truly Teach Me Tarot Course which is viewed daily by thousands of people around the world. Two Major Arcana Cards and one being the very positive World Card suggested some very determined and committed work would be carried out today. The World was also telling me that I would feel happy with what I would achieve by the end of the day. They almost feel like Destiny Cards and The Hierophant whispers to me of it being my duty and vocation to carry out such work. Now I am feeling elevated and purposeful. My life has meaning and I am doing what I should be doing. 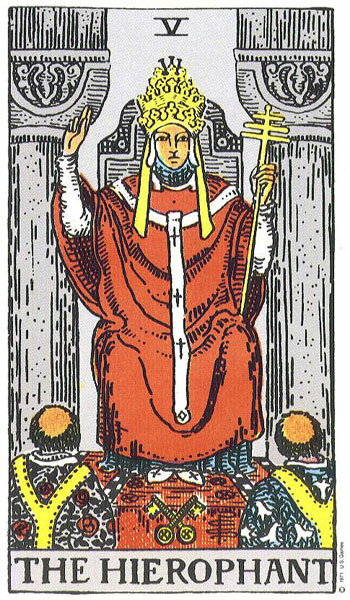 As I look again, I remember that The Hierophant channels divine information and acts as an intermediary between the spiritual and the physical. This makes me think about how I feel sometimes after reading back over my work, especially at a later date. I sometimes question if I wrote it for I cannot remember typing it. And where did I get all that information from? Did I really write that? Maybe I am being helped in my writing at times by a higher source or power. Gosh these Cards have certainly given me a lot to think about. The Heirophant carries the number of 5, so I must remember to be as open in my teachings as possible. I must teach and not preach. The The World totals 3 and speaks of creativity, growth and progress. Their combined number is 8, a number of strength, commitment and hard work. Yesterday, I felt almost overwhelmed by all the work and writing I had still to do. I cried to my partner over dinner, ‘will I ever be finished?’. I was feeling tired, had sore shoulders and a bad neck after eight hours of typing and questioned why I was putting myself through such torture/ The number Eight tells me that I have the strength and determination to see this through to the end, and that now is not the time for quitting after so much work has already being completed. The World confirmed to me that yes, I would successfully complete and not to worry because everything was progressing nicely. Looking at her again, she is also telling me to move my body more, to take breaks from the computer for exercise and enjoyment. I was very stiff after yesterday. She is telling me that it is not healthy to sit for so long. Just before I finish writing about my Cards today, I see something else about The World Card that has caught my attention. I have been making some bunting for my niece and it is almost complete. It will be for her new baby’s nursery. This will be her first baby. She supplied me with the fabric, all in different patterns. This evening I will be meeting with her to discuss which order she wants the bunting hung in. I will be bringing with me the long white cord and we will pin the bunting in order and in place while I am there. My niece is very excited about getting the bunting. 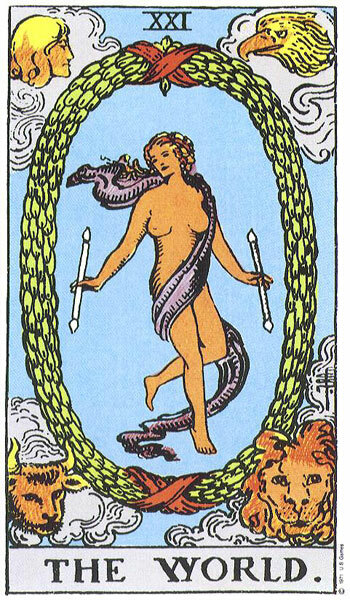 In the World Card, the circle of green laurel with the images at each corner are symbolically flashing at me likening them to the bunting hanging on the cord. The figure in the circle is also suggesting to me my niece’s baby which is due to be born soon. Maybe I am mad, but the more I look, the more I see. Nice Cards, thank you Universe. Earlier in the week my partner, who also does his Daily Cards drew The Knight of Wands and King of Pentacles. Let me fill you in. He has put an offer in on a house in Dingle on the South West Coast of Ireland. His offer has been accepted but he needs to secure a small mortgage to make up the shortfall. He had spent weeks in and out of the building society bringing them all the documents and paperwork they had required, and at times demanded. No sooner would he have all his details handed in, they would be back on to him looking for more and more. This has been going on for weeks and on the other end of things, the vendor has been getting restless. My partner was told a month ago that he would have word on his loan application within a week. By the end of last week he still had heard nothing. On Monday morning he pulled these two Cards and brought them to me. I immediately told him not to expect any news in relation to his mortgage application that day. I could see clearly what was going on. 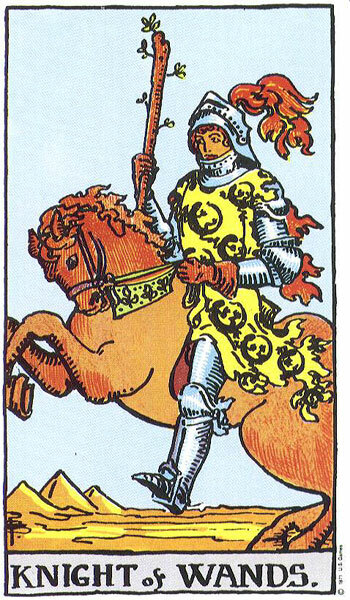 Here was my poor partner, depicted as The Knight of Wands and that told me enough. I already knew he was very frustrated with all the delays. Normally he is the quiet and calm type, but in recent weeks he has been getting tenser and tenser about the whole situation. The Knight of Wands was rearing to go, impatient and dreadfully frustrated that he was not being allowed to move forward with his plans. He wanted to move now and was finding it hard to restrain his horse. I could sense an outburst coming soon and I hoped he would not let all hell break loose on the phone the next time he spoke with them. The Knight of Wands is overwhelmingly eager with what he wants to do and where he wants to go, but not everyone shares his enthusiasm and desperate need to be off. Just look at who he is up against when it comes to his mortgage application being decided upon, The King of Pentacles of all people, well why am I not surprised? The King of Pentacles would strongly represent banks, building societies and lending institutions. The King of Pentacles is not going to allow himself be rushed into making any rash decisions where money is concerned, regardless of how urgent The Knight of Wands thinks it is. 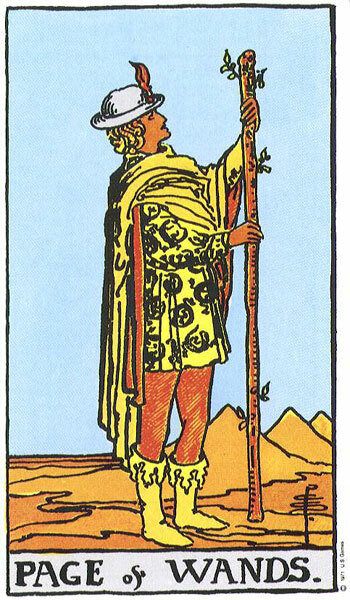 The King of Pentacles is not a risk taker, neither is he a gambler. He will want to make sure that all the i’s are dotted and t’s crossed before he will sign off on my partner’s mortgage. Maybe they wanted more paperwork from him? The King of Pentacles represents the old establishment so my partner is up against the system here. He will have to wait and hope for the best, for this guy is going to be thorough and methodical. If that means an extra week or two to wait, then there will be nothing he can do about it. The King of Pentacles is the big bull and won’t be budged until he is ready. I pointed to the golden Pentacle sitting on The King’s lap and explained to my partner how symbolic this Pentacle was. ‘See that, he is holding what you are looking for and so badly want. At the moment, he is in possession of this golden egg’. Wouldn’t you just love to reach into that picture and take it from him saying ‘thank you very much, but I will take that now’? However, The King of Pentacles is telling you to be patient a little while longer while he does all the maths. He is a man of his word so will not leave you waiting for ever. So you best put away that wild horse of yours and take off that armour my poor man. Yesterday I pulled two Cards asking ‘what is it that I need to know today?’. I drew The Page of Wands and The Ace of Pentacles. Aha I thought, these are more like it. I instantly called my partner down the stairs. Beaming, I showed him the Cards I had just pulled. ‘Look, says I, good news is on the way’. The Pages of The Court Cards are long known for their role as messengers. They deliver the post and news in The Tarot. 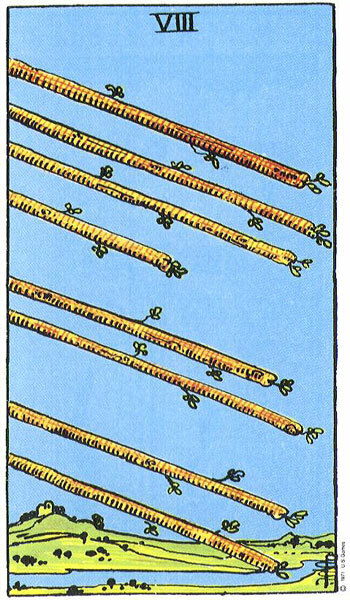 The Page of Wands would bring good news in relation to a course of action, movement, travel and career. I had no doubt that this Page was going to bring news in relation to my partner’s loan application. 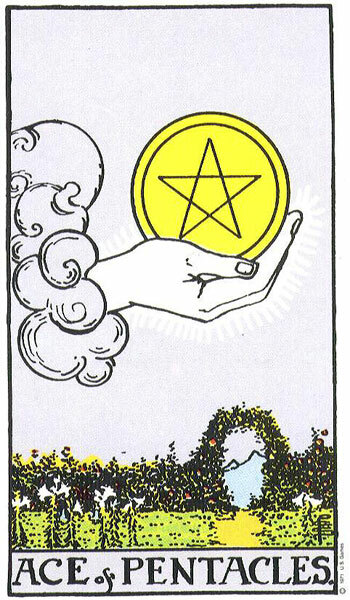 Because he was Upright, the news would be good and especially so because the other Card drawn was The Ace of Pentacles. ‘Look’, I pointed to it. ‘The Golden Egg, and it is being offered to you’. I put my hand on my heart and told him that after looking at the Cards, news was imminent and his mortgage application had been approved. He was going to get the money and it would be enough for him to secure his dream little cottage in Dingle. Great stuff. Well the postman came and went yesterday but there was nothing from the building society in the mail. We rang the building society on the chance that word was with them, but not yet in the post. Neither of us could wait any longer. No, they had heard nothing yet. We would have to wait. By 5pm yesterday evening, we still had heard nothing. It was the close of business and nothing more could be done for the day. My partner went upstairs to read his book, and I suppose sulk a bit. However, he was back down the stairs a few minutes later and couldn’t contain himself. He had been reading his book when he noticed the alert light flashing on his phone. Picking it up, he saw that there had been a missed call. It hadn’t rang, we would have heard it. The signal is bad where I live so sometimes calls go straight through to the voice mail. Yes, the missed call person had left a voice message. He had listened to it and between broken signals and noise he could hear that it was the girl from the building society calling him about his mortgage application. She was ringing him to let him know that word had arrived in their office just at closing time of his approval in principle. She asked him to ring her in the morning but, yes, it had been approved. Of course it was too late to ring her back but the Cards were right. Now he is running around full of life, just like a kid, just like The Page of Wands. excited and enthusiastic about the road ahead. Just let me share two more with you. Last week I pulled my usual Daily Cards and got The Three of Pentacles and The Empress. It didn’t take me long to work them out. Due to my developing TMJ Disorder, I have been suffering badly with my jaw, head, neck, shoulders and arms. My balance has also been seriously affected. TMJ involves multiple treatments so I have to do many things to get relief, and also need to attend the maxillofacial consultant in November. My jaw has become misaligned and is causing havoc throughout my body. One of the therapies I am using to help my jaw and muscles work properly is vocal coaching/singing lessons. It was my pharmacist who suggested this as a form of therapy for me and not my doctor. I suppose that is the way it goes these days. Doctors seem to be too busy to even look at you. Well I started my singing lessons about two months ago and now go for one each week. I cannot tell you the difference it has made in my life, not only is it helping my jaw, it is also opening me up as a person and helping me to realise undeveloped potential. After 51 years on this earth, I have discovered that I am a natural soprano and am now be trained in that direction. I am hitting notes that leave me stunned. I have this powerful voice I knew nothing about, and my self-confidence and self-esteem have soared as a result. I always loved singing, like a lot of us do, but I never thought that I could sing. It really has been amazing. Anyway, who better to understand that then The Empress herself. A lover of drama, music and artistic abilities, she often appears to let you know that you have untapped potential in these areas and insists that you do something about them. It is The Empress who encourages you to join the local musical society, choir or drama group for she loves anything that is creative. She herself is a wonderful singer and greatly supports those who are trying to develop their own abilities. Well, she was there in my Cards that day to acknowledge what I was going to be doing and where I was off to. 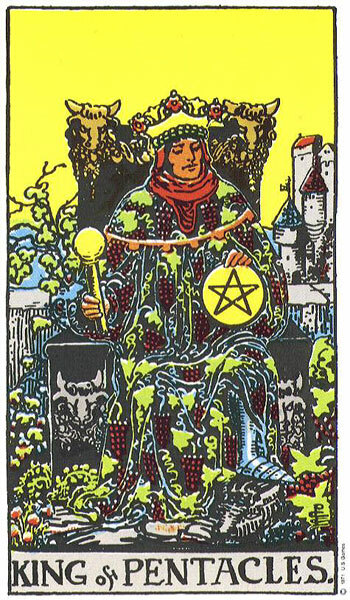 The Three of Pentacles was also acknowledging that I was a student of music and was off to my lesson that day. I still have a lot to learn but this Card was telling me that I had a really good Singing Teacher who had high standards and a strong reputation. I would learn well under his tutelage. My Cards were both numbered Three, so this was a very powerful message to me that it was money well spent. The singing was helping me to grow in so many ways. I certainly was looking forward to heading off for my singing lesson that day, that is until my partner drew his two Cards and showed them to me. He does know a bit about The Tarot but he prefers to come to me with his Cards for interpretation. 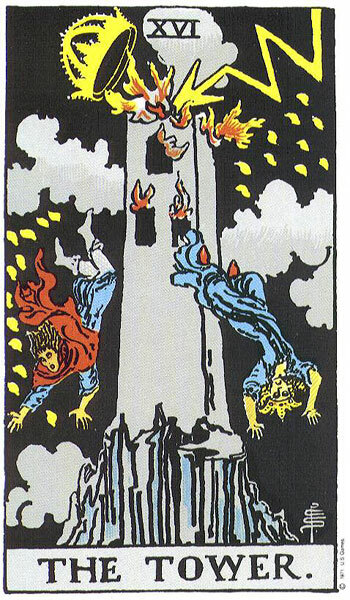 The Cards he had drawn were The Tower and The Chariot Reversed. My mood changed and I felt ill at ease. My partner was coming with me, doing singing lessons too. He is a musician and was also enjoying the opportunity to improve his singing voice. We were leaving to go to Dublin for our Lessons. The weather that day was awful, with dark skies and torrential downpours. I felt a bit apprehensive after seeing his Cards. I asked him to drive slowly and to take his time, even if we were late. I told him to keep focussed on his driving for I believed his Cards were acting as a warning. The Reversed Chariot can sometimes suggest accidents with cars, or just a problem with a car, but alongside The Tower I was taking no chances. The Tower can bring massive upheaval, disruption and shock in its wake. What I feared was a car crash. All the way into Dublin, I was nervous. Visibility was very poor on the roads as the rain poured down from the sky. As usual, heading into Dublin, the traffic got heavier and heavier. We seemed to be surrounded by heavy artic vehicles which shot waterfalls of water down our windscreen as they passed. We got to Dublin in one piece and forgot all about the journey while we enjoyed our Lessons. When we started the drive home, the weather had further dis-improved. I reminded my partner to watch his driving and to take no chances. We took our time coming home and just as well for the rain was blinding. It was impossible to see the road ahead, yet several vehicles still insisted on travelling at speed. We managed to make it off the motorway in one piece but now had to face the twisting back roads of the countryside. There was flooding everywhere and it was difficult to get through. We were both very silent as I did not want to distract my partner who was completely focussed on getting us home in one piece. We were nearly there, just a small village to pass through. As we rounded the bend coming out the other side of the village, the cars were coming to a standstill. In all my years, I had never encountered a build up of traffic here before. We were wondering what was going on. As the traffic inched along, my partner thought flooding while I thought accident. As we moved forward slowly, we could see the familiar flashing lights of a police car. There were traffic cones on the road and a sign that said, Road Closed. However, the traffic on our side of the road was being let through. As we got nearer the police car, I saw the big truck, a refuse collection truck. There had been a collision alright. The front windscreen was severely cracked and I got the sense that the driver had not been wearing his seatbelt. I believed that it was his body or head that had damaged the windscreen. I could not see any other vehicle involved, maybe it had been towed away? The police were waving all the cars on. It was as we passed the refuse truck I saw the other vehicle. It was another large truck and it had left the road. It had gone straight through the hedging of a field and had turned over. It was now lying on its back in the field and I was shocked. The approaching roads into the village all have a very low-speed limit. For this vehicle to have left the road and flipped over, there must have been speed involved. We saw no sign of ambulances but the accident had been quite recent. We both hoped that no one had been seriously hurt. We were very shook as we drove in silence the rest of the way home. When we pulled into the driveway, I relaxed a bit and turned to my partner. ‘That was the Reversed Chariot and The Tower’. It had not happened to us, but who knows where a couple of minutes earlier would have taken us? Would we have been caught up in the accident? My partner had heeded the warning in the Cards and had driven as safely as he could without taking his attention from the road at any stage. We were relieved to be home in one piece. Yes this is very true, i did this but when i was doing readings i realised no cards are bad because they, are giving us a message in time, and they are a warning, it is dishearting when you pull challenging cards and you have to relate this to the client, but again i think it is neccary to always tell the truth, and while i am compasionate i hope i keep this about myself as A Reader in future,, spot on. Yes, we all want to see the obvious nice Cards come up, and we often reshuffle until we get them, even me. Show me a Reader who hasn’t! I agree, when you are reading for someone and they are so hoping for a particular answer, then you see the challenging cards coming out, then you see them look at the cards and look at you, both of you know that it is not going to be plain sailing. Finding the right words and blending in the interpetation of these challenging cards is very important.